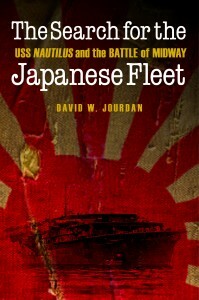 In The Search for the Japanese Fleet, David W. Jourdan, one of the world’s experts in undersea exploration, reconstructs the critical role one submarine played in the Battle of Midway, considered to be the turning point of the war in the Pacific. In the direct line of fire during this battle was one of the oldest boats in the navy, USS Nautilus. The actions of Lt. Cdr. 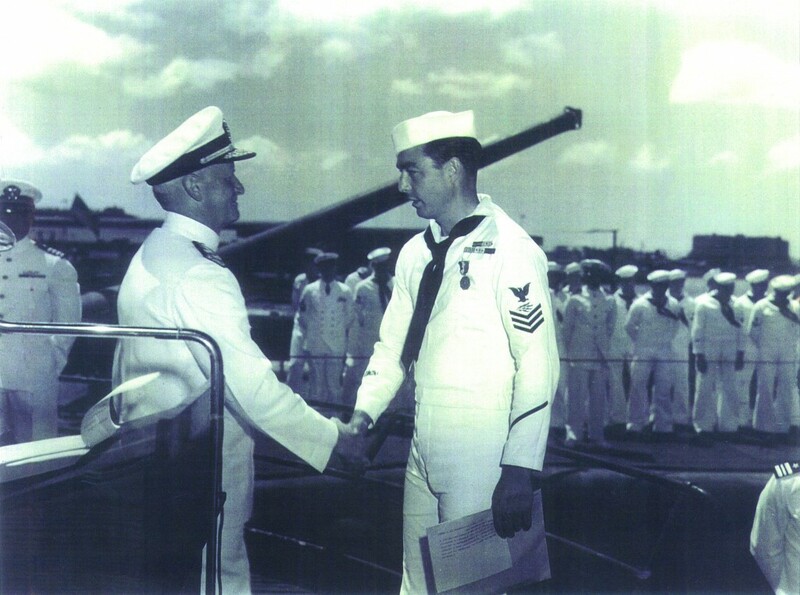 William Brockman and his ninety-three-man crew during an eight-hour period rank among the most important submarine contributions to the most decisive engagement in U.S. Navy history. Fifty-seven years later, Jourdan’s team of deep-sea explorers set out to discover the history of the Battle of Midway and find the ships that the Allied fleet sank. Key to the mystery was Nautilus and its underwater exploits. Relying on logs, diaries, chronologies, manuals, sound recordings, and interviews with veterans of the battle, including men who spent most of June 4, 1942, in the submarine conning tower, the story breathes new life into the history of this epic engagement. Woven into the tale of World War II is the modern drama of deep-sea discovery, as explorers deploy new technology three miles beneath the ocean surface to uncover history and commemorate fallen heroes. In The Search for the Japanese Fleet, I argue that Nautilus attacked the aircraft carrier Kaga, not Sōryū as Captain Brockman thought, owing to outdated recognition guides. The information in his possession showed Kaga in its pre-war configuration, with a three-quarter length flight deck and uncovered bow. Otherwise, the two ships resembled one another, and both had a unique starboard-side island superstructure. (Kaga was significantly heavier, 39,000 tons vs. 16,000 tons, as it was built on an armored battlecruiser hull, but that did not affect its appearance through the periscope.) Wreckage from a vessel identified as Kaga was found in 1999 at the position of the Nautilus attack. Yet Captain Brockman and his crew recovered a life ring from Sōryū! How can this be? Nautilus made her attack at around 1400 local time and evaded depth-charging destroyers by heading south. Nautilus first surfaced that evening at 1941. By that time she was twenty miles south of the attack location, but much closer southwest of the location of the dive bomber attacks that mortally wounded both ships (as well as Akagi) that morning at 1020. With winds and currents pushing floating debris to the west, it is likely that Nautilus fell among flotsam from the morning attacks on all three ships rather than from the particular ship they attacked at 1400. Regardless of which ship Nautilus attacked, the old boat and her gallant crew were key members of the team of aviators and sailors that caused the destruction of the carriers of Kidō Butai that June day in 1942 and turned the tide of the war in the Pacific. Excerpt from The Search for the Japanese Fleet. 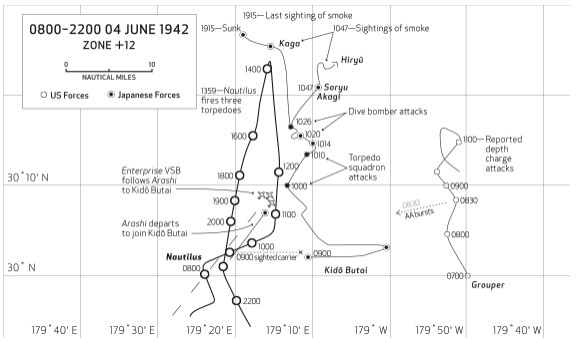 Location of dive bomber attacks at 1020 is closer to Nautilus position at 1941 than attack at 1400. Illustration by Bethany Jourdan. In my book, I report that the ship that Nauticos found, based on the position of the Nautilus attack, was clearly identified to be Kaga. Brockman was equally certain he attacked Sōryū . How do we resolve this contradiction? See next week’s blog post for a possible explanation. William Brockman departed on eternal patrol from Boca Raton, Florida, January 2, 1979, at the age of seventy-four. 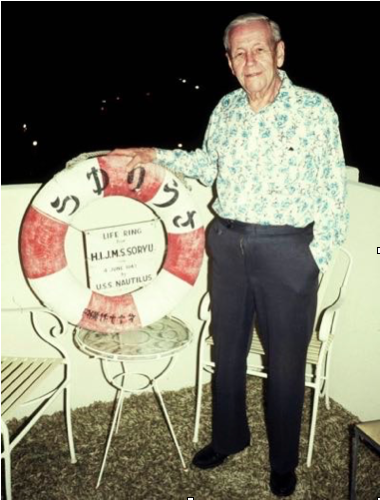 Rear Admiral William H. Brockman, Ret., posing with life preserver from Japanese carrier IJN Sōryū, in Boca Raton, Florida, 1976. Photo and excerpts from letter courtesy Larry Brockman, with permission. With the dramatic exception of USS Nautilus, U.S. submarines made a poor showing at the Battle of Midway. However, with more experienced and aggressive commanders, better torpedoes, newer boat designs and growing numbers, the tide turned. By war’s end, the submarine force, representing less than two percent of the Navy, accounted for fifty-five percent of Japan’s maritime losses. This achievement came at high cost – nearly 3,500 U.S. submariners perished during the war, over twenty percent of those who made patrols. This was the highest casualty rate for any branch of the U.S. military. May those brave men be … never forgotten! Excerpt from The Search for the Japanese Fleet. 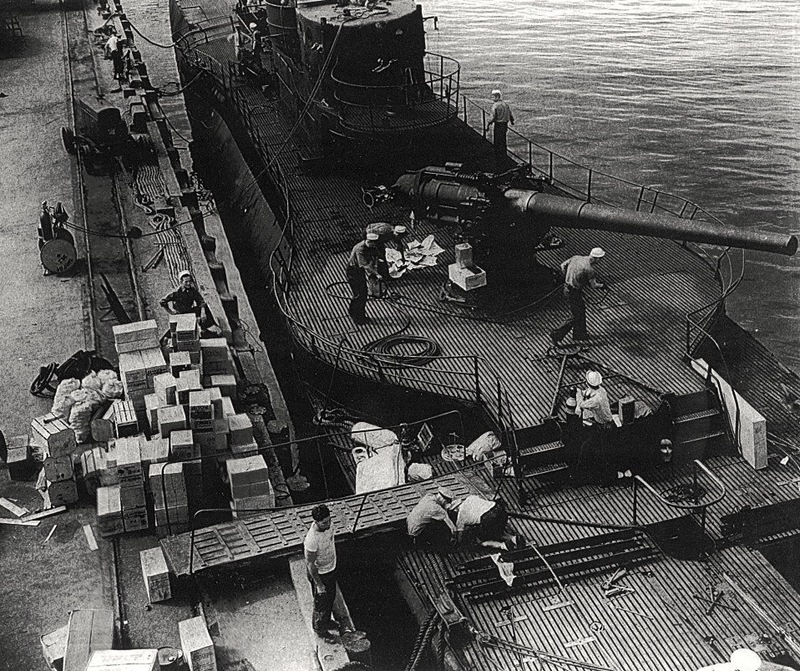 USS Nautilus taking on provisions prior to departing Pearl Harbor, 11 December 1942. Note the huge six-inch caliber deck guns. U.S. Navy.